You can schedule and create reports to demonstrate your compliance with HIPAA regulations. 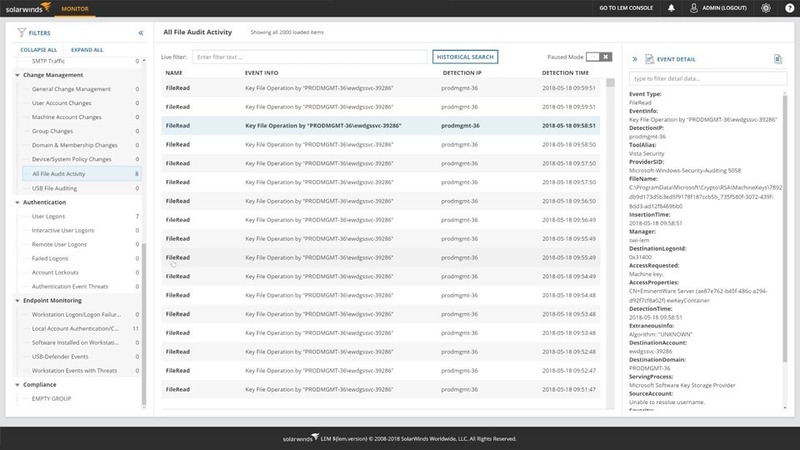 Log & Event Manager includes out-of-the box reports to make demonstrating HIPAA compliance easy. Part 164 - “Security and Privacy” of the HIPAA regulations requires several procedures such as regularly reviewing information system activities, including audit logs and access reports. These procedures can all be accomplished with a Security Information & Event Management (SIEM) solution. If you forward audit logs from all of your applications, servers, and network devices to a SIEM—like Log & Event Manager—you can easily report on all information system activity. This makes reporting much easier than trying to manually pull logs from each system individually. When implementing software to help your organization be HIPAA compliant, make sure you understand the details of what you need to collect and how you need to report it. You should look for solutions that are quick to deploy and easily customized to the specific needs of your organization. SolarWinds Log & Event Manager includes out-of-the-box reports for HIPAA with rules that can be easily modified to demonstrate your compliance. Collecting data from all required devices is a straightforward task with Log & Event Manager. Simply install an agent on the servers you need to collect logs from or configure the device to send syslog data, then configure a connector to log and store exactly what you need. No single product will make you HIPAA compliant. You need to take the time to fully understand the regulations your company is responsible for meeting and then create a plan for how you will address each requirement. Also, don’t rely solely on these regulations to ensure your IT security. Make sure you understand your environment and potential attack vectors and proactively update your security defenses.